The other day CFL and I were looking at the calendar and thinking about what else we’d like to accomplish this year before the rainy season begins in earnest. He mentioned a couple of hikes that he still wanted to do. I reminded him that at the beginning of the year we’d agreed to do a metric century (100 kilometers or 62 miles) bike ride in honor of CFL’s 60+ years of age. We’d picked out a group bike ride that we wanted to do: the Chuckanut Century in Bellingham on September 14. But then I had to go and break my arm, which put a serious crimp in my cycling and running plans for this year. After I was finally cleared to ride again in July, we thought long and hard about that century, but by then we had a date conflict with another event. It was looking like the metric century just wasn’t going to happen this year. Autumn arrived quite dramatically; high temperatures dropped precipitously exactly at the time of the equinox. We’ve had nearly half an inch of misty rain over the past week. Still, I watched the weather forecast and found a small window of opportunity. On Friday morning I casually suggested to CFL that we go for a bike ride on Saturday. 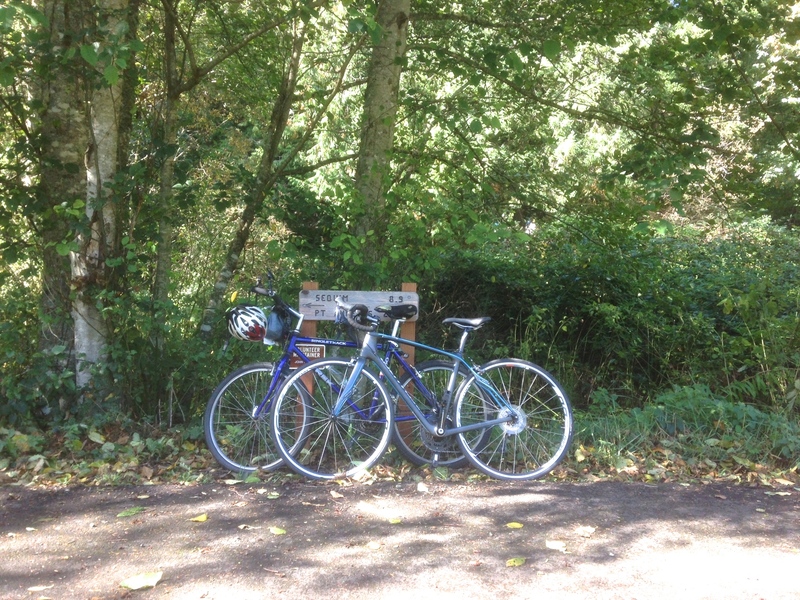 What would you think, I smoothly added, if we were to get up early, take our time, and ride to the end of the Olympic Discovery Trail and back? How about if we throw in an extra three miles somewhere along the way and make it a 62 mile day? Our longest ride to date had been 43 miles. We were talking about going almost 50% further than that! Yet I was reasonably confident that we could do it, assuming that we’d take our time and take breaks along the way. It was a perfect day for a bike ride. It was sunny but cool, about 50 degrees, when we started out at 9:00 AM. It never got warmer than about 65. There was no wind — hence no annoying head wind all the way home. The trees were beginning to turn colors in earnest. In many places there were leaves already down on the pavement, which made giant swishy sounds as we rode through them. At the end of the trail my GPS watch read 29.25 miles. We continued on a quiet road until that road ended at the busy highway at exactly 30 miles. We turned around at that point and stopped soon after to eat our lunch of mixed nuts, dried apricots, and Clif Bars. On the way back we stopped at a local diner for milkshakes. We figured we’d burned at least a thousand calories by then and the shakes tasted really good. We picked up the pace in the final few miles because we’d promised ourselves dinner out at our local gastropub. I was smelling and tasting the beer in my mind as I pedaled! I didn’t even mind the extra 2+ miles we rode along the downtown waterfront just to get our total mileage to the right number. At the end we were tired but we mostly felt elated. We’d done it! 62.3 miles. Our total elapsed time was a leisurely just over eight hours. Actual riding time was 6:11:52 — we’d managed to average ten miles per hour. After dinner, at our second pub stop to be precise, we ran into some friends. They asked us what we’d done that day. We told them, and they were dumbfounded. Later I posted a quick status on Facebook: Just finished a 62 mile bike ride. My first metric century! Friends commented: Wow! Impressive! Congrats! I could never do that! Well yes, you could. It’s not like I just got on my bike for the first time and rode it 62 miles. You have to work up to these things. If I can do it, so can you. I look at photos of myself from six years ago. I was never fat, but I was quite flabby. I carried myself awkwardly. I looked old and world-weary. Here I am on one of the happiest days of my life: on graduation morning from my PhD program. I felt old. And I didn’t like that. When I started running, I wasn’t merely slow. Most of the time I wasn’t even running! It took me months to work up to running a quarter of a mile without stopping to walk. I used to tell myself, Just run to that tree, to that shadow, okay now you can walk — and now run to that rock! My feet hurt. My knees hurt. My hips hurt. But somehow, my brain liked it and was happy about doing it. So I kept going. I like myself much better this way! I was 53 years old when I started to run. I was really, really slow. I’m still slow, but I’m not as slow as I used to be — and as I complete my sixth year as a runner I now have 3,456 miles of running experience behind me. I have a daily activity streak (walking, running, cycling, and/or hiking some distance) that now stands at 636 days and 4,538 total miles. If I keep running, I might have a shot at qualifying for Boston. The older I get, the slower the qualifying standard becomes. There is still a chance that those lines might someday cross for me. 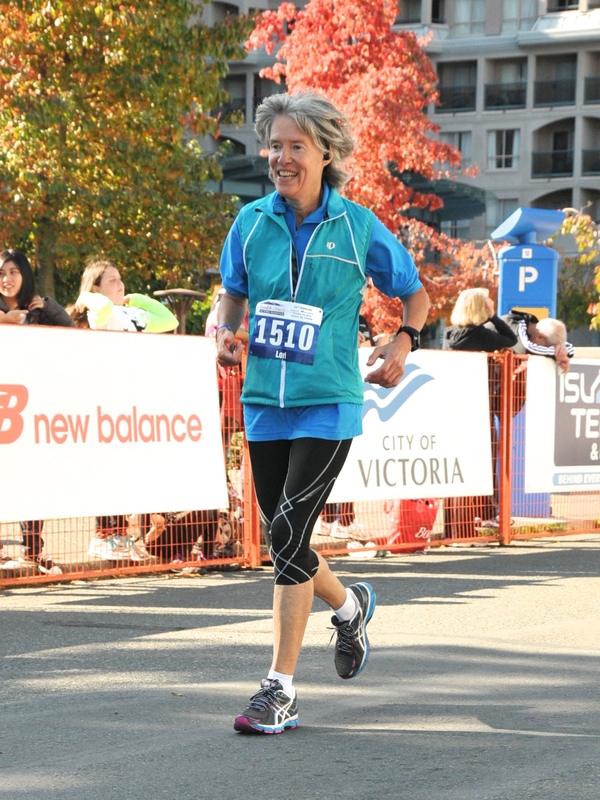 4:40:00 at age 65? Yeah, that sounds doable. As for cycling? I don’t know where I’m going with that, but I hope I’ll still be able to ride my bike for many years to come. CFL and I have talked about doing a multi-day ride someday. I’d love to tour around Scotland by bike. I’m a mediocre middle-aged athlete and I feel healthier and more vibrantly alive than I ever have in my life. I could never hike up that hill. Run a whole mile? No way! Break a 10 minute mile? Impossible! Break a 9 minute mile? In my wildest dreams. I’ll never run a marathon, no way not ever. But what I’ve learned is that a lot of seemingly impossible things become not merely possible but fun if you simply practice and tackle them one step at a time. Now I’m going to step away from this computer and go for a walk. It’s sunny and brisk outside. Having fun and enjoying life, one moment at a time.